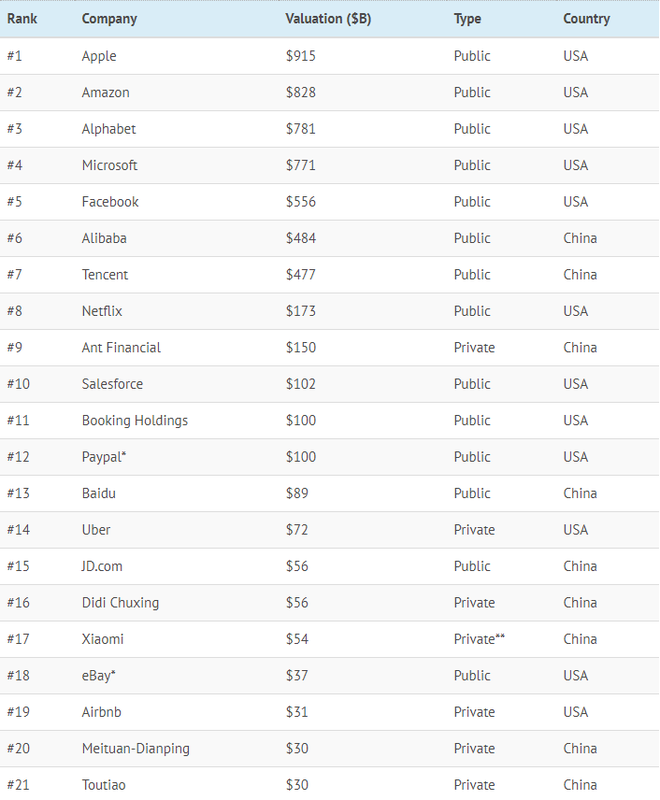 The world's 20 largest tech companies now exclusively US or China-based. Large companies can be located all over the globe. For example, massive auto companies can be found practically anywhere on a map. Ford (USA), Toyota (Japan), Volkswagen (Germany), Hyundai (South Korea), Volvo (Sweden), Tata Motors (India), and Magna (Canada) are just some of the biggest companies involved in the production of vehicles or parts. While the banking, pharma, energy, and retail industries also have geographic spread as well, the same cannot be said for the rapidly-growing tech industry. 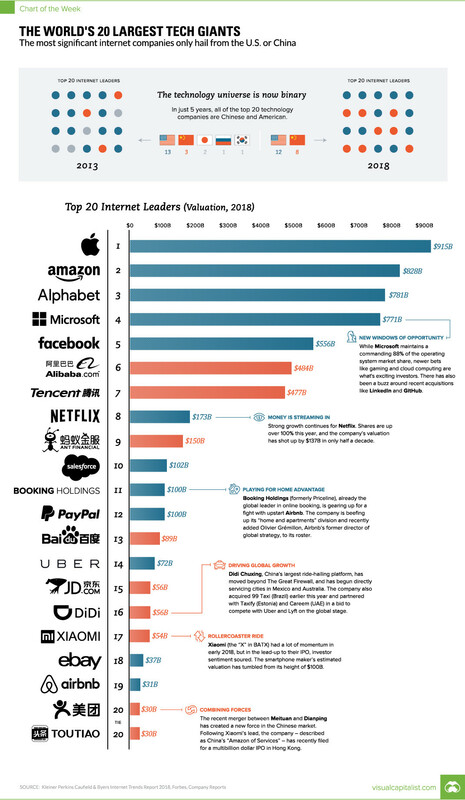 The most recent edition of Mary Meeker’s famous Internet Trends 2018 report highlighted the top internet companies in the world by valuation, with an interesting and perhaps unintended outcome. Of the 20 largest tech giants globally, a total of zero are located outside of the United States and China. *In Meeker’s chart, she kept eBay-Paypal together as one entity. We’ve separated them based on the 2015 spinoff. **Xiaomi’s valuation has been in question ahead of its July 9 IPO in Hong Kong, and we’ve used the most recent valuation estimate of $54 billion here. In total, the above list of companies is worth $5.9 trillion, with a 75%-25% split in terms of USA/China. It’s also worth noting that the list excludes Samsung, likely because the South Korean company is quite diversified in its manufacturing activities (TVs, refrigerators, air conditioners, batteries, microwave ovens, etc.). Aside from the USA-China duality, the other major noticeable aspect of the list of the world’s largest tech giants is that it clearly shows a divide between top-tier companies and those further down the ladder. In fact, there is not a single company with a valuation between $200 billion and $450 billion. The top seven companies on the list account for 81% of the total value of the list, and they are all above the $450B mark. These include behemoths like Apple, Alphabet, Amazon and Microsoft, but also two big Chinese companies as well (Tencent, Alibaba). Meanwhile, the bottom 14 companies muster up just 19% of the value – a fact that underlines how hard it is to vault a tech company into the upper echelon of the market.